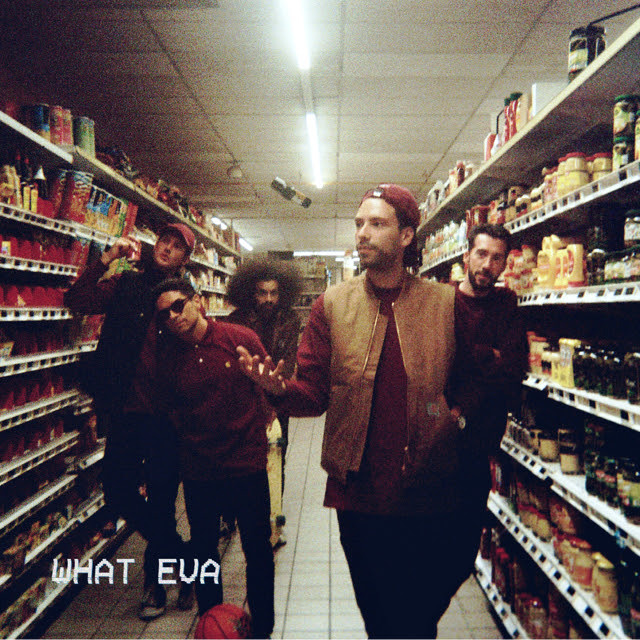 Rising French electronic collective and label owners, La Fine Equipe, are pleased to announce details of a brand new visual for ‘What Eva’ ft. Mr. J. Medeiros released through Nowadays Records this December. The band detail the video: “We wanted it to look like a 90s VHS that was put on the VCR. Part of the charm was its fuzzy, imperfect look so apparent during that era. ‘What Eva’ embodies a strong DIY ethos and we the band, did most of the filming ourselves using a small handheld camcorder. Everything was filmed on location in the supermarket. There are no 3D models. The song and visual is also a homage to the strong visual elements often found in 90s music videos like Mc Solaar’s ‘New Western’ and French hiphop outfit IAM’s ‘Je danse le Mia’. There is a surreal sequence in the video where we are surrounded by a kaleidoscopic display of supermarket products. To summarize, we had a complete blast filming this”. La Fine Equipe are strongly influenced by hip-hop royalty like J Dilla, Mos Def and Madlib. The four French beatmakers, Oogo, Chomsky, Mr, Gib and Blanka from (Marseille and Paris collectively continue their journey with a new album due in March 2019. The group’s debut album, ‘La Boulangerie’, attained cult status and propelled the band into the mainstream consciousness. This led to the release of three more critally acclaimed albums ‘Fantastic Planet’ (2010), ‘La Boulangerie 2’ (2011) and ‘La Boulangerie 3’ (2014) and the creation of celebrated electronic label Nowadays Records that recently celebrated their 5 year anniversary with a special 23 track compilation ‘Nowadays V’ featuring label signings like Fakear, Clement Bazin, Robert Robert and more. La Fine Equipe have also taken their hi-octane live shows across Europe including festivals like Les Vieilles Charrues, Dour, Les Francofolies, the Printemps de Bourges and the Couleur Café festival and a mini tour of Asia. The band also won the Deezer Adami Award and glowing reviews in tastemaker press like Arte, MixMag and Boiler Room, who invited them to be part of their legendary Boiler Room Sessions in Paris and London.